Technology affects every area of our lives, both personally and professionally. For sports fans, the world of apps and live streaming has made it easier to keep up with the on-field action and the latest team news, wherever we might be. Still, nothing can quite equal being there in person. Perhaps that is why we are accustomed to seeing the virtual seek to come closer to the physical. You need only look at the online casino business to see the lengths they go to in order to make the experience more realistic, as they know that even a generous deposit bonus does not make up for the atmosphere of playing Book of Ra deluxe in a physical casino environment. This is why aspects like live gaming or Virtual Reality are being pursued so strongly in the sector. Yet it also works the other way. In this modern era, where Generation Z has grown up around the virtual, stadium designers know they need to incorporate tech into their designs to keep attendances high. Here are five stadia that are doing so in spectacular fashion. Since opening in 2005, this unmistakable sports destination in Munich has acquired the nickname Schlauchboot or “inflatable boat” and it is obvious to see why. It has the unique claim to fame of being the first sports stadium in the world to be capable of changing colour to match the teams out in the middle. It is also immense, and in addition to the 71,000 seater sports complex is home to the Museum of Bayern Munich. Protecting the earth’s resources is a responsibility we all need to take seriously, and perhaps we should take inspiration from those who designed this remarkable stadium in Kaohsiung, Taiwan. The dragon motif means it looks like no other stadium on earth, but the really clever part from a tech perspective is that the roofing area is entirely covered with solar panels. 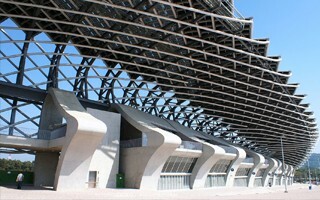 As a result, the National Stadium is almost entirely self-sufficient in terms of its energy needs. Staying in Asia, our next destination is the Sapporo Dome in Japan. It’s a multi-purpose venue that is home to both the Consadole Sapporo football team and baseball’s Hokkaido Nippon Ham Fighters. Supporting two sports that are so different in one venue provided immense technological challenges. The solution? The playing surface can transform from grass to artificial turf overnight, an innovation that is being replicated in the new Tottenham Hotspur stadium in London. It is impossible for visitors to Stockholm to miss the Ericsson Globe. With a diameter of 360 feet, it is the largest hemispherical arena in the world, and has a futuristic, science-fiction look to it. Smart technology has been integrated into its design, making it truly multi-purpose, hosting international events such as Eurovision as well as a range of sporting activities. Perhaps more than any other stadium mentioned here, this one provides a glimpse into the future.